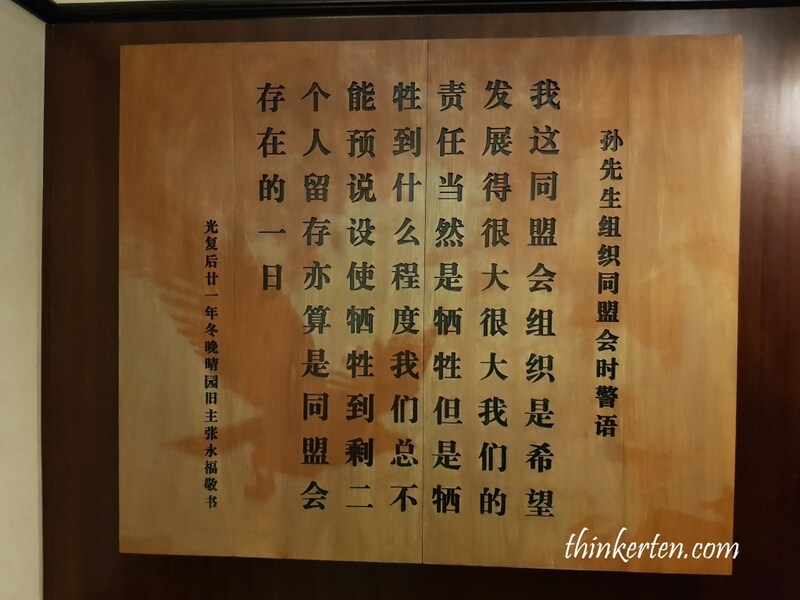 There are many Sun Yat Sen Memorial Hall in the world, and one at Balestier Singapore. The two story mansion has changed many owners. 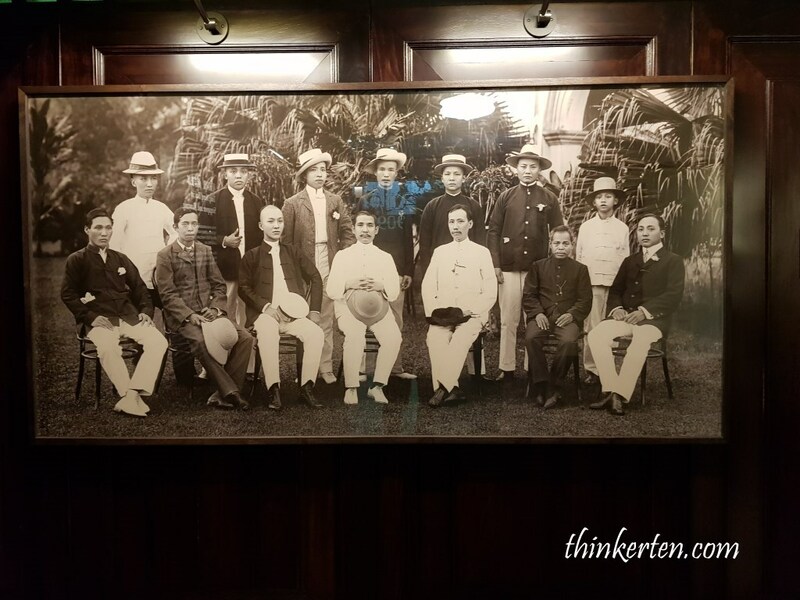 First the classical colonial villa was built by a wealthy Chinese businessman Boey Chuan Poh on a sugar plantation owned by Joseph Balestier. Then, the villa changes few owners and lastly Teochew businessman Teo Eng Hock bought it as a retirement home for his mom and called it Wan Qing Yuan/晚晴园. 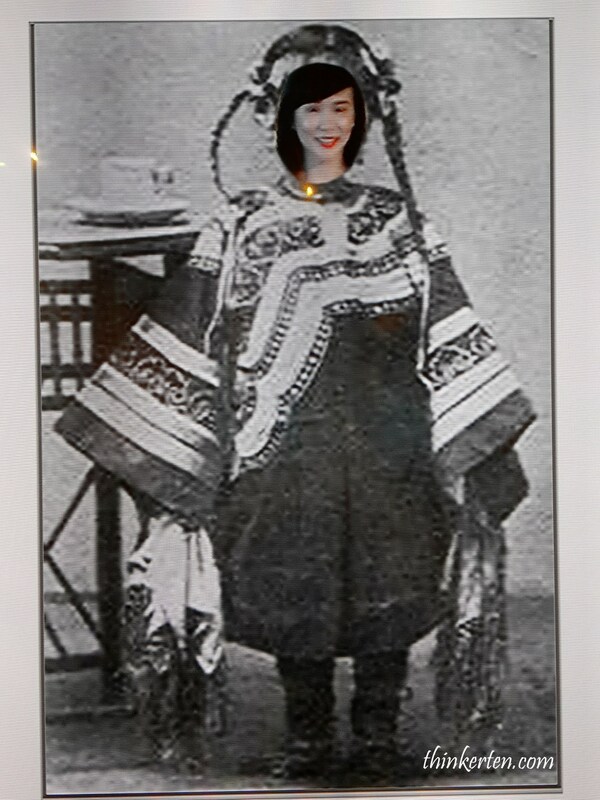 Teo offered the villa to Sun Yet Sen as his residence when Dr Sun arrived in Singapore in the late 1905. 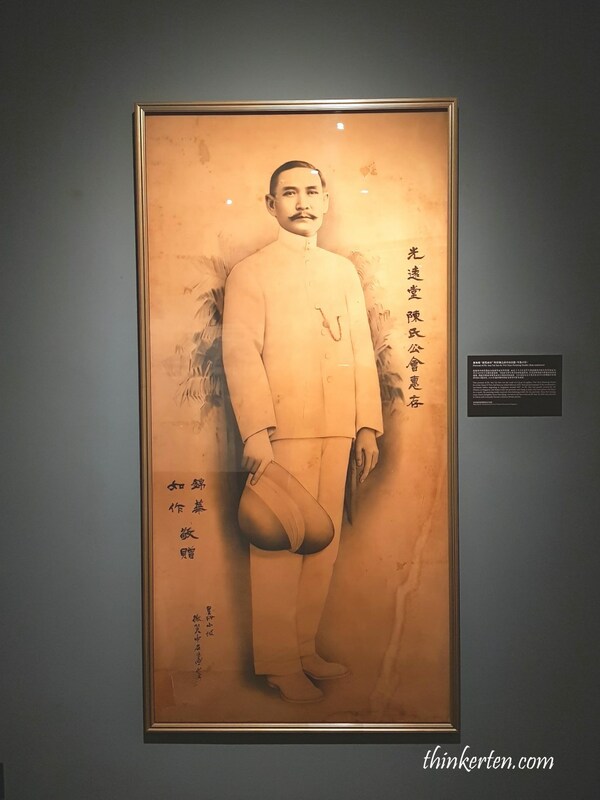 In his nine visits to Singapore, Dr Sun stayed in Wan Qing Yuan on four occasions and the villa became the base for his revolutionary activities in Southeast Asia or Nanyang. The compound of the garden of the villa is quite spacious. 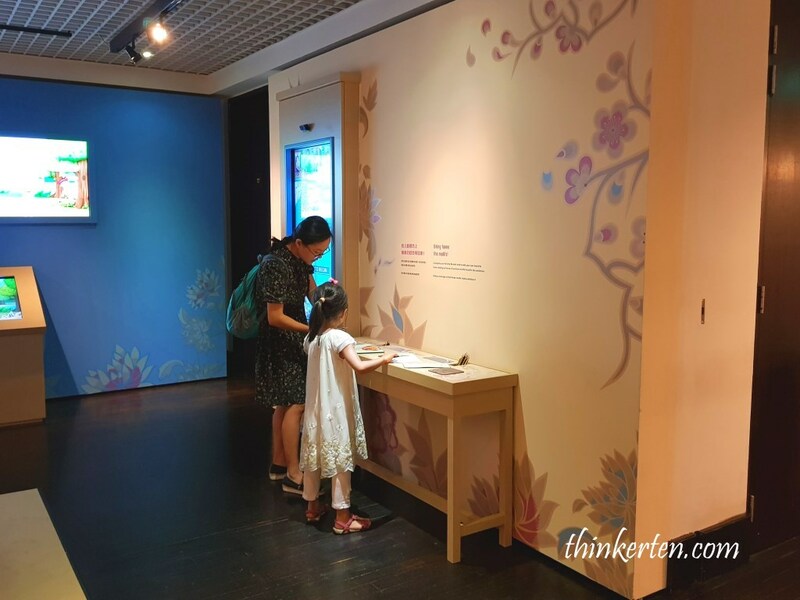 There was a two-metre tall bronze wall mural which spans 60 metres which depicts scenes of Singapore as a fishing village in the 1840s and the Sook Ching Massacre in 1942. 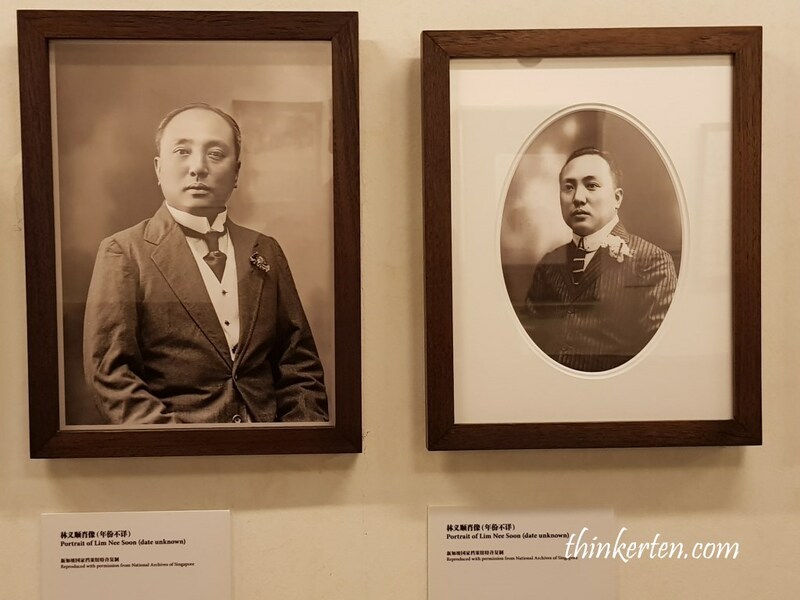 Dr Sun established the Singapore branch of Tongmenghui, the Chinese Revolutionary Alliance, and from which he coordinated various activities in the region. 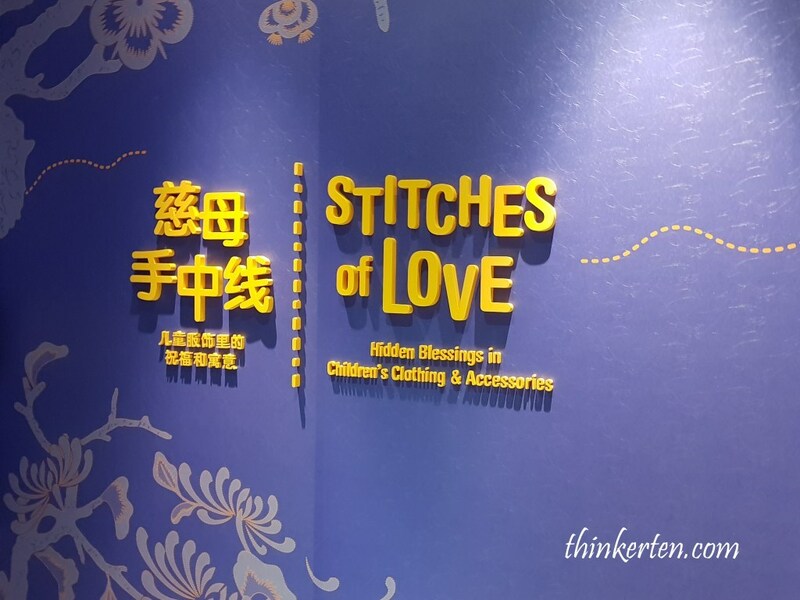 With the support of Chinese communities globally, including in Singapore. 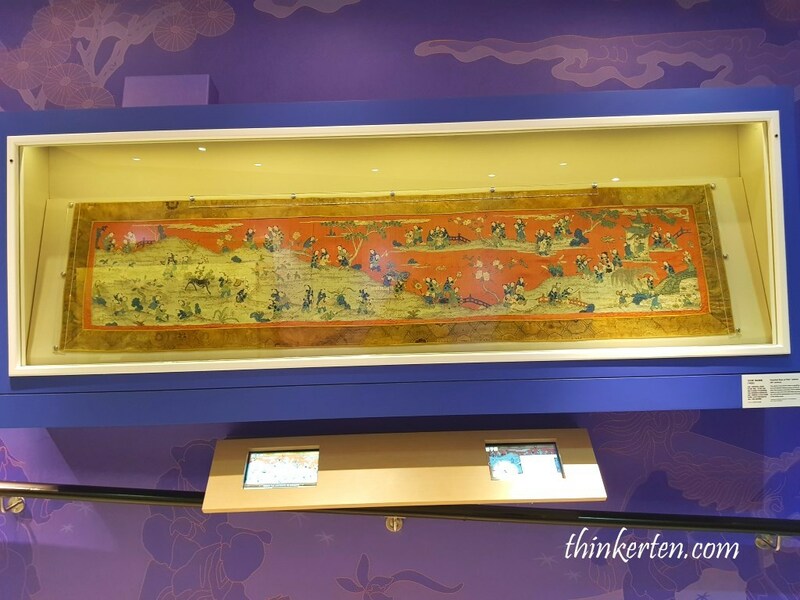 The museum could not be completed without Dr Sun’s famous and favorite quote: 博愛/ “universal love” ! 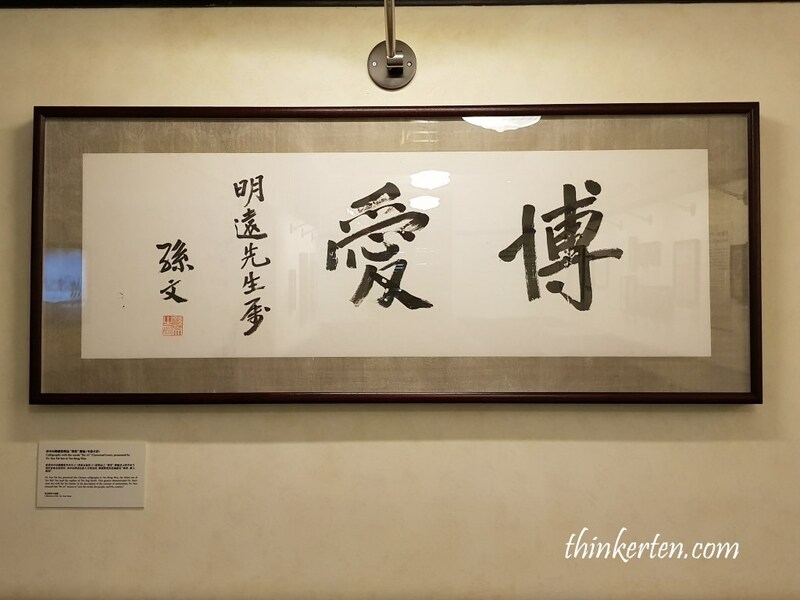 This piece of calligraphy was presented by Sun Yat Sen to Teo Eng Hock’s nephew, Teo Beng Wan. 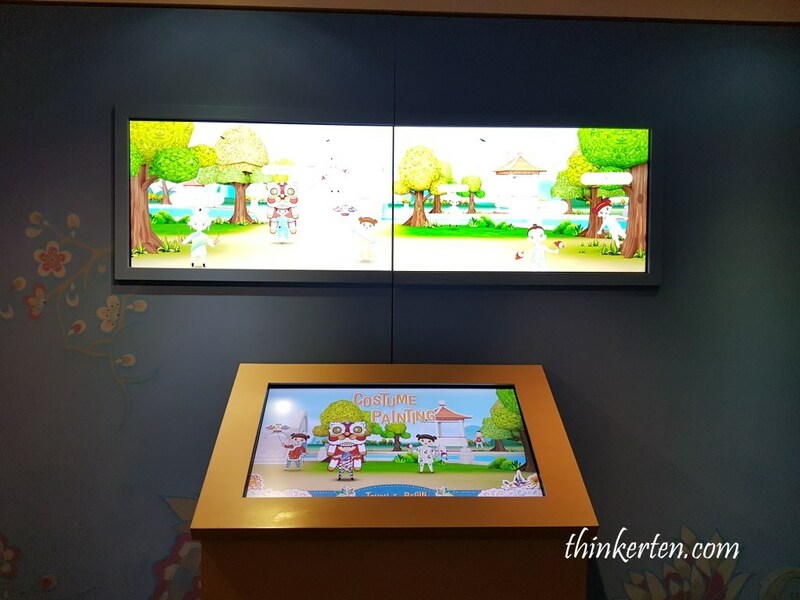 The exhibition is complemented by three multimedia stations, providing visitors with a multi-layered, interactive experience. A digital photo booth for visitors to personalise photographs taken with stickers inspired by the artefacts. 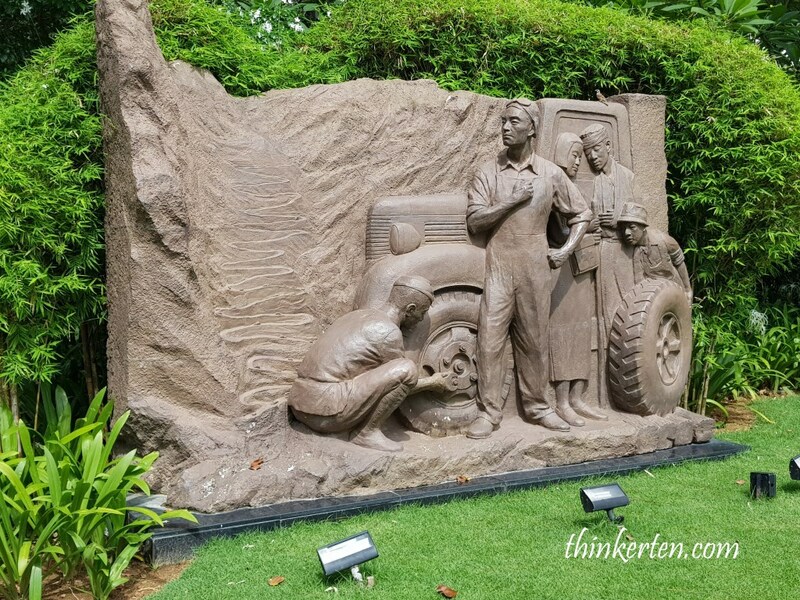 In the early 20th century, Singapore was located strategically at the southern tip of the Malay Peninsula, and had advance infrastructure and a large Chinese population. In addition, she stood at the intersection of Eastern and Western thought. These were the reasons why Dr Sun chose Singapore as his overseas revolutionary base. 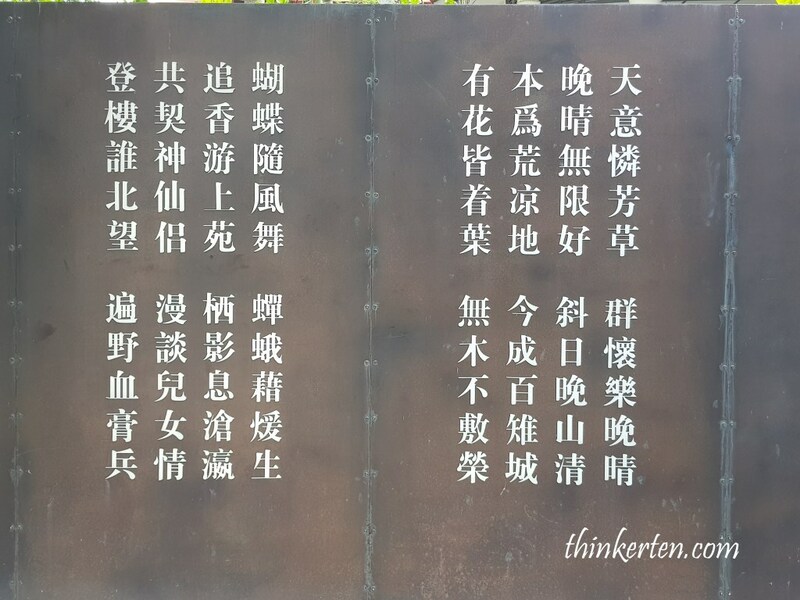 And Wan Qing Yuan undoubtedly was an important command post for Dr Sun’s revolutionary activities. 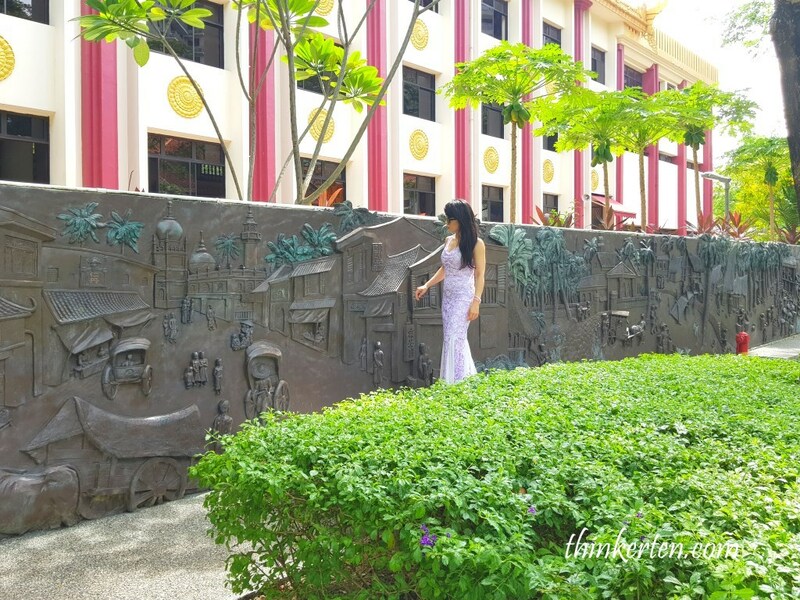 This villa was the site of the establishment of the Tong Meng Hui (Chinese Revolutionary Alliance) Singapore Branch. 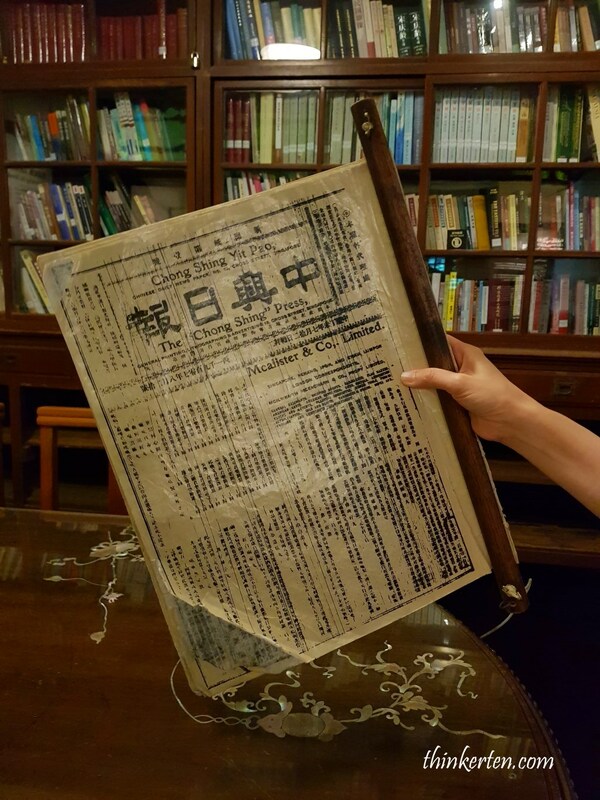 Dr Sun started a newspaper to serve as the official mouthpiece of the revolution, advocated setting up reading clubs, and organised public lectures and operas to generate publicity for the revolution and garner support overseas. 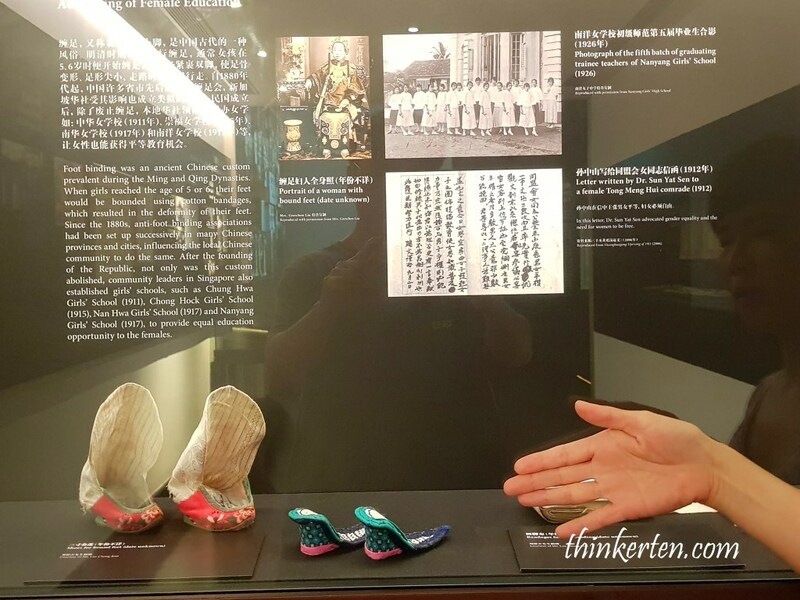 Foot binding became popular as a means of displaying status (women from wealthy families, who did not need their feet to work, could afford to have them bound) and was correspondingly adopted as a symbol of beauty in Chinese culture. 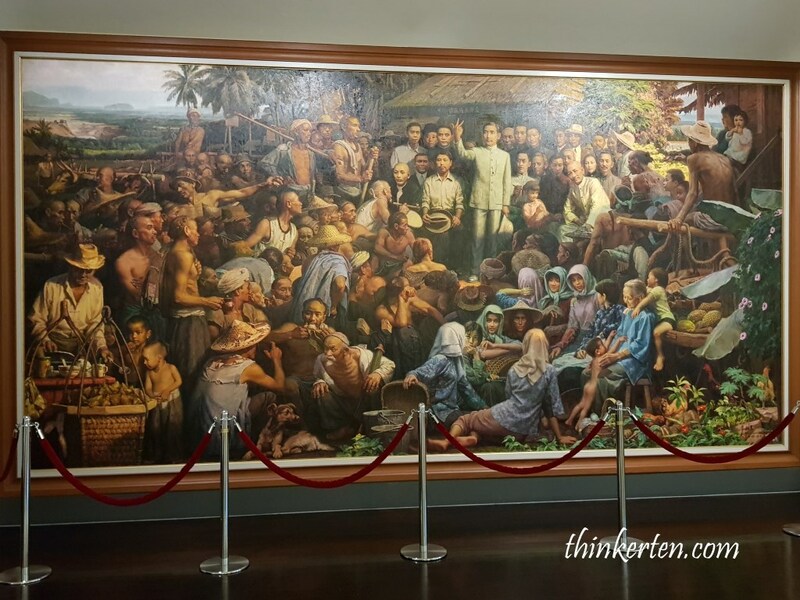 Painting showing Sun Yat Sen in Nanyang. 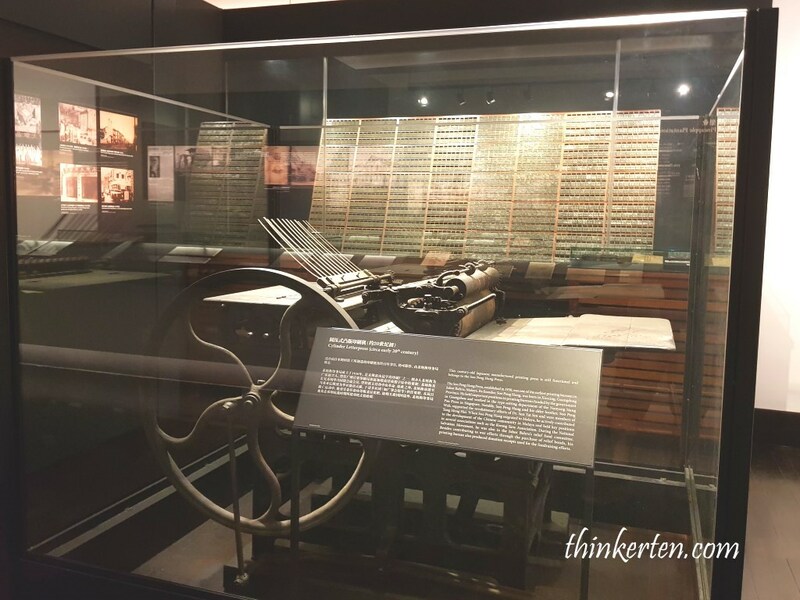 On the way out, you can see an old artifact – old recorder. 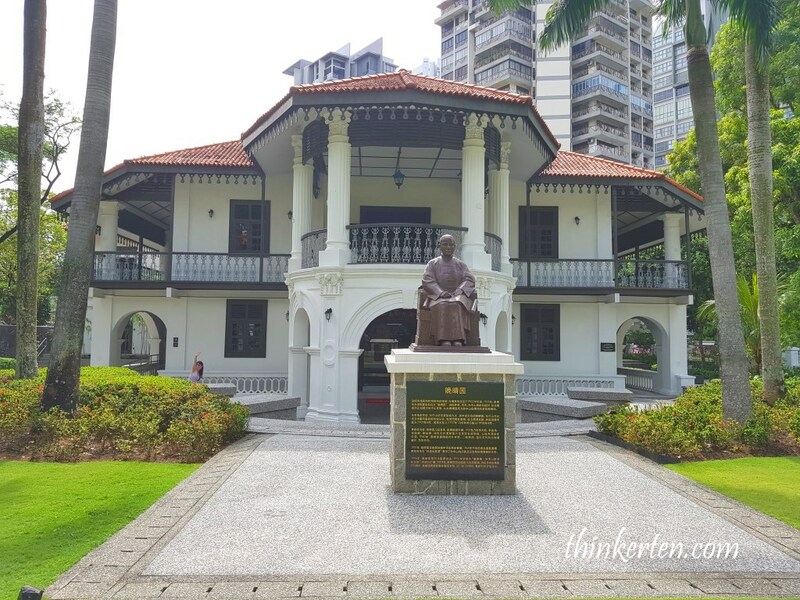 Sun Yat Sen Nanyang Memorial Hall is a beautiful two-storey Victorian villa with open veranda at the front and sides. The building materials were imported from Europe. The pillars, railings and window frames are all original. 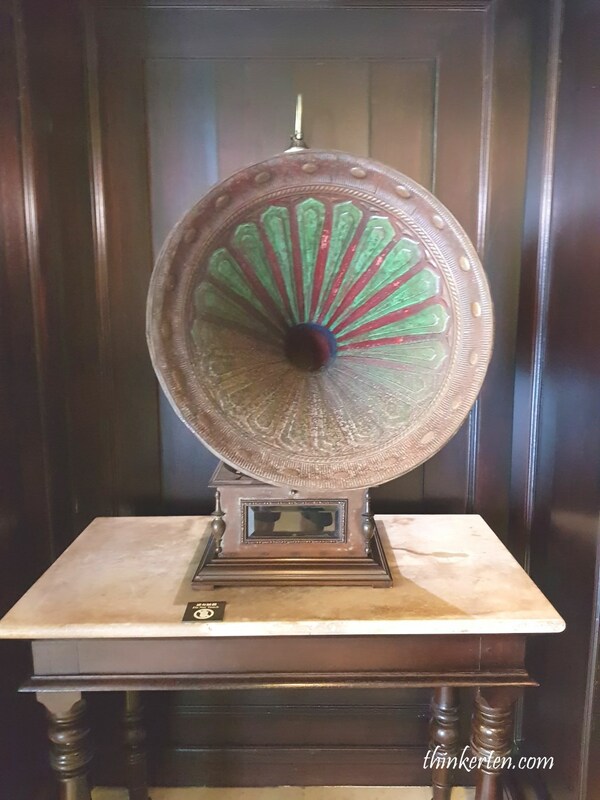 Well, the interior of the villa has been redecorated in a Peranankan style. 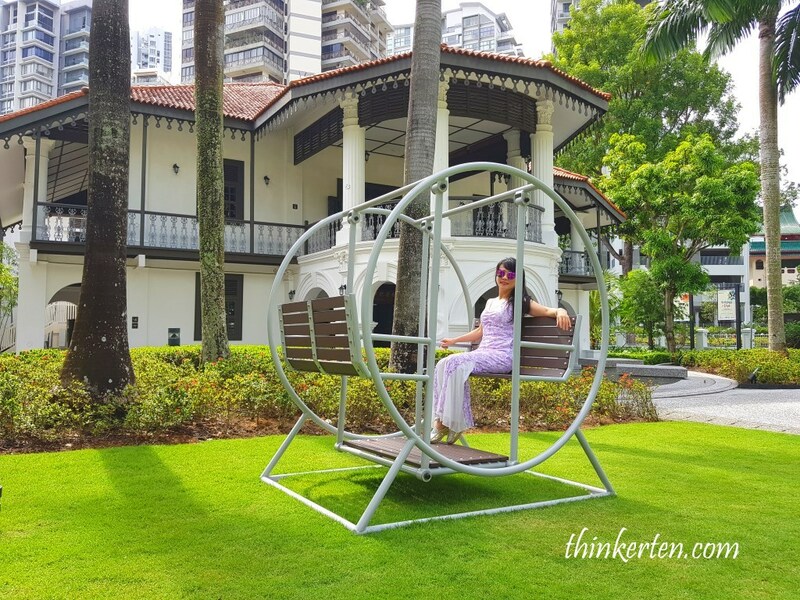 After visiting the Sun Yat Sen’s Memorial Hall, you can have rest at pretty garden at Zhongshan Park, which is just across the road. 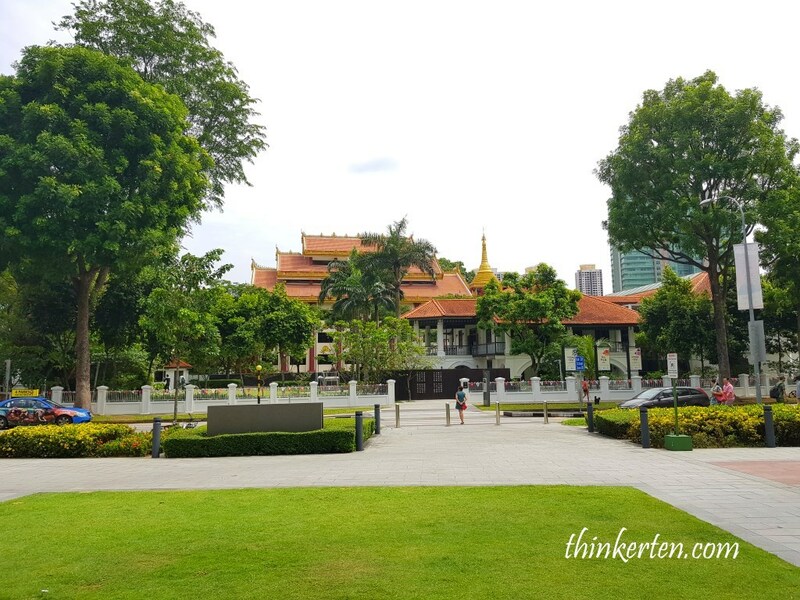 After visiting the Sun Yat Sen’s Memorial Hall, let’s explore Balestier since we are here! 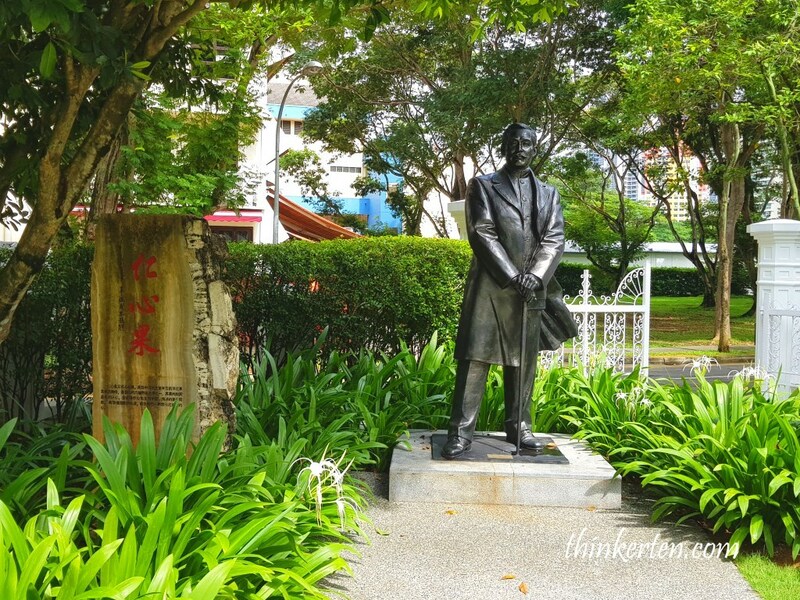 The name Balestier was coming from a guy called Joseph Balestier, who was the first Consul to Singapore for the United States of America serving between 1837-1852. The current Balestier used to be Joseph Balestier’s sugar cane plantation estate. 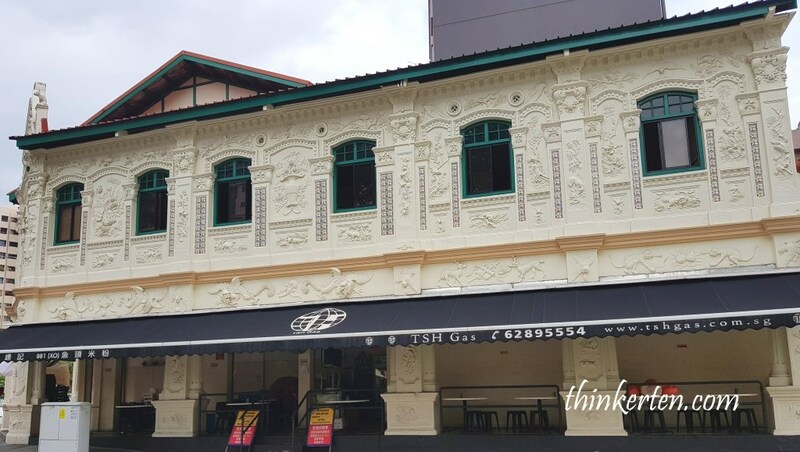 The stunning shophouses located at 418 Balestier Road were built and developed more than 80 years ago, in 1928. 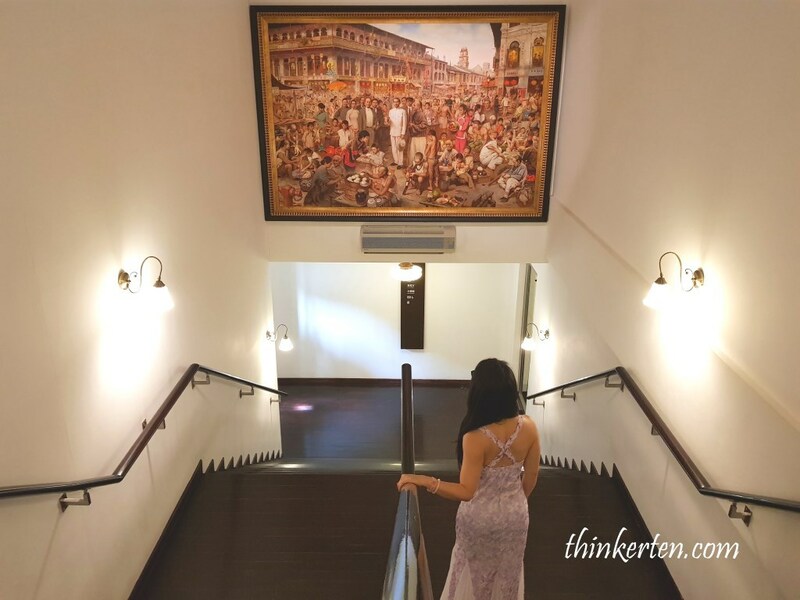 Pay attention to the hybrid architectural style which is the fusion of European features and Chinese feature – also known as ‘Singapore Eclectic’ or ‘Chinese Baroque’. Try search for the word ‘Sim Kwong Ho’ inscribed on the roof facade. It is interesting to find a small cart at the corner of Boon Teck Road. At first I thought someone is selling some herbal tea but there is no seller. Then only I realized the water or tea is free for thirsty people who passed by this area. 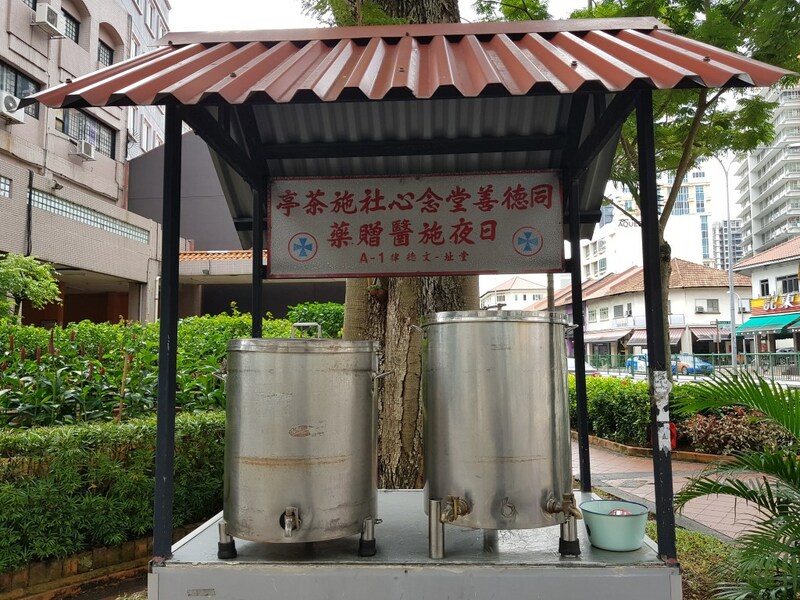 The free tea was provided by temple along Boon Teck Road called Thong Teck Sian. The setting of the cart reflect nostalgia for the past. 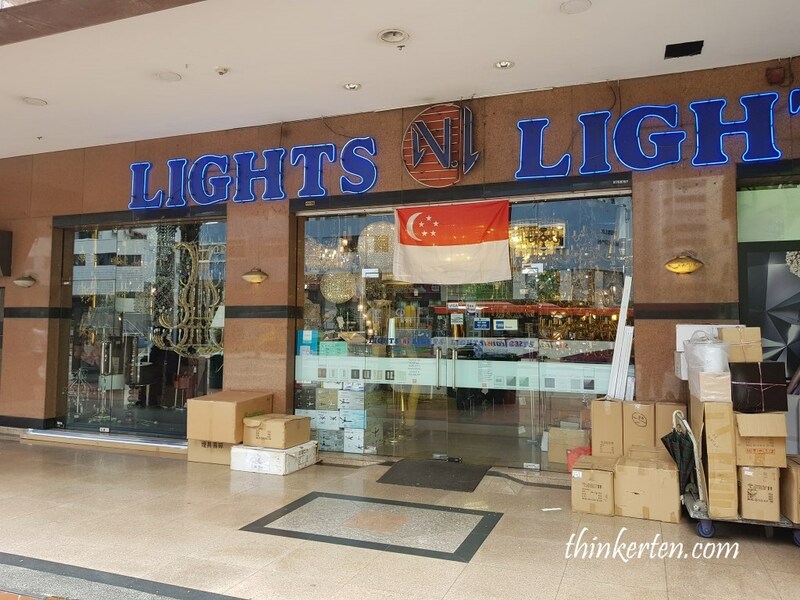 If you are moving house and need new sets of lights, this is the place to come to search for your lights. The whole streets are full of lighting shops. 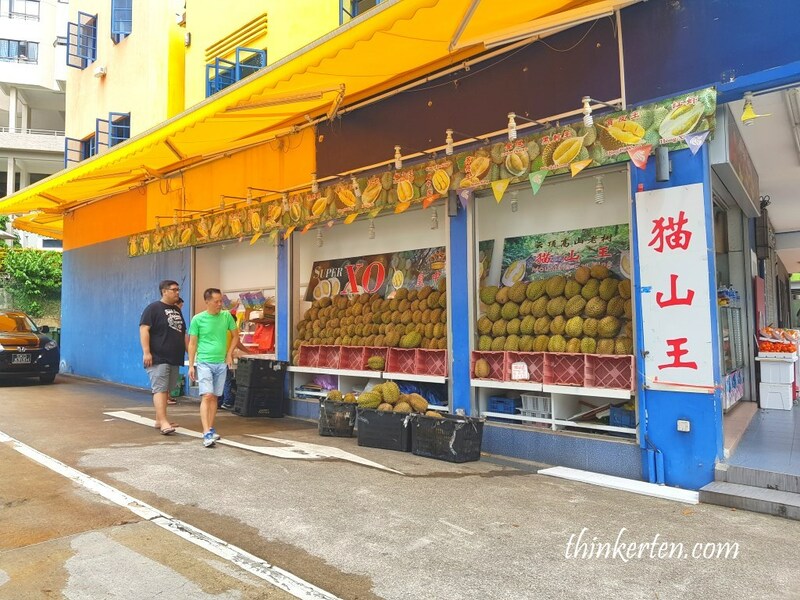 Durian lovers, this is the place to get nice durian. This is no longer a market but more of a food court now. 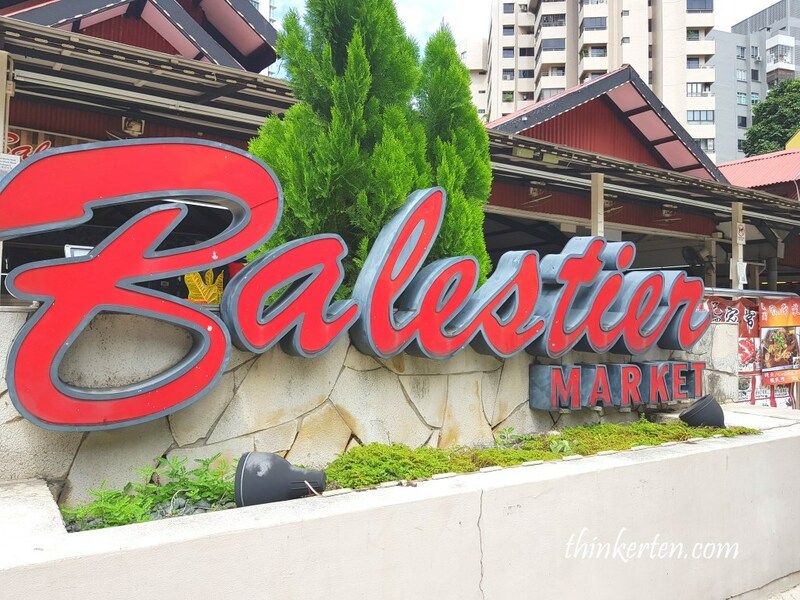 Balestier Market was built in early 1920s, providing local vendors with a permanent place to sell their stuff. This is a historical place because during the Second World War, the market served as a center for distributing food rations. There is another name for Balestier Market which is even more popular called ‘Or Kio’ mean ‘Black Bridge’ in Hokkien. Why? Simply because there is a dark timber bridge along Whampao River. 'Or Kio' mean 'Black Bridge'7th month ghostBalestier Durian StallBalestier MarketBalestier TrailChinese BaroqueExplore BalestierFree Water & Tea at corner of Boon Teck RoadJoseph BalestierLight Shops in BalestierLim Nee SoonSim Kwong Ho ShophouseSingapore EclecticSmall shoes for foot binding womensugar cane plantation estateSun Yat Sen Memorial HallThe Chong Shing's PressTongmenghuiWan Qing Yuan/晚晴园Zhongshan Park博愛/ "universal love"